How much oil growth do we need to support world GDP growth? A few days ago, I showed the close relationship between growth in world oil consumption and growth in world GDP. In this post, I will extend that analysis by building a model that shows how much of an increase in world oil supply is need for a given increase in world GDP. This model indicates that if we want the world economy to grow by 4% per year, world oil supply will need to grow by close to 3% per year. This is more than world oil supply has grown per year since the 1970s–giving a clue as to why the world is having so much problem with economic growth now. Theoretically, the model should also be able to predict what would happen on the downside as well–what would happen if world oil supply should suddenly start to contract. We will talk about what these indications are, but also discuss why they are probably misleading. The result may very well be quite a bit worse than the model predicts. In my earlier post, we saw that over time, both the rate of growth in oil supply was declining, and the rate of growth in GDP was declining. In both the previous and the current post, we are looking at “real” GDP growth–that is GDP growth, with the inflation component removed. Figure 1. World Oil Supply Growth vs Growth in World GDP, based on exponential trend lines fitted to values for selected groups of years. World GDP based on USDA Economic Research Data. 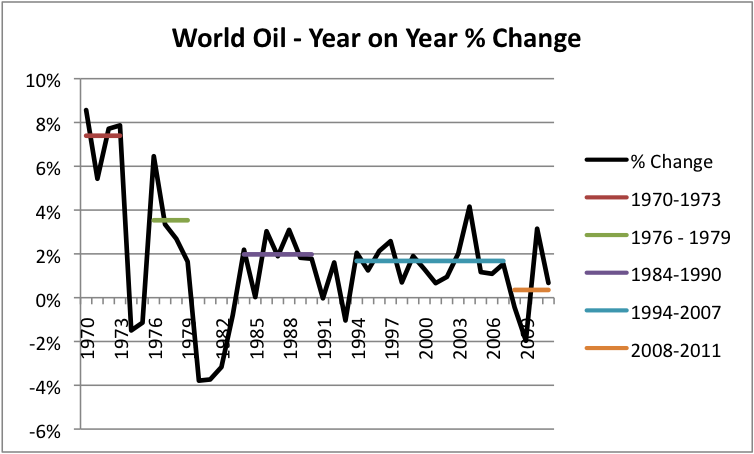 In my earlier post, we looked at several groups of years, based on time periods when world oil supply was increasing. Let’s look at oil supply growth for the same ranges, on a year on year percentage growth basis. Note that the time periods are one year shorter (1969 -1973 becomes 1970 – 1973), because we are looking at year on year percentage increases. Figure 2. Annual percentage increases in world oil supply with simple averages for the ranges indicated in Figure 1. Amount of colored line is simple average of amounts for range shown. In Figure 2, notice that average oil supply growth is gradually becoming lower and lower, looking at the time periods down the side of the graph. This is similar to what we saw in Figure 1. computed on a slightly different basis. 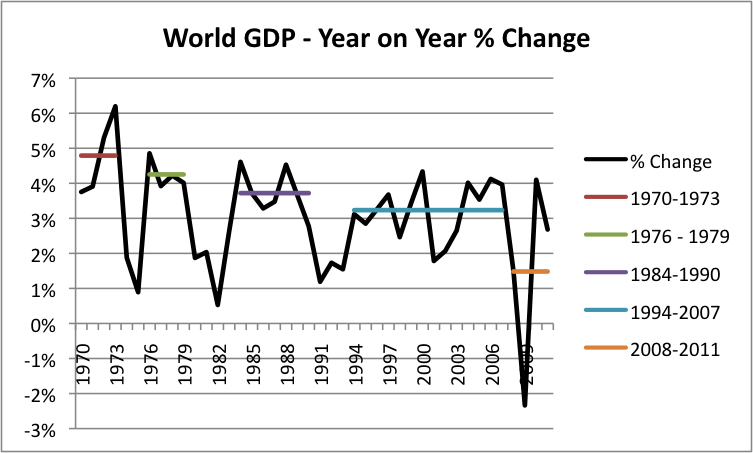 If we look at annual changes in world real GDP, the indications are similar. Figure 3. Annual percentage increases in world real GDP with simple averages for the ranges indicated, corresponding to the ranges shown in Figure 1. Here again, as we go down the exhibit to later periods, we see declining average growth in real GDP. In fact, comparing Figures 2 and 3, we see that they are similar in several respects. Not only do they both tend to have growth rates that trend downward, but the “gaps” between the colored lines tend to be low on both graphs, indicating that when oil supply growth is low, world real GDP tends to be low as well. In my previous post, we talked about the close link between oil supply and the economy. While many people believe that oil supply use grows because a growing economy gives rise to greater demand for oil, the reverse seems also to be the case. If there is short supply of oil, indicated by high price, people cut back on discretionary expenditures, and recession ensues. 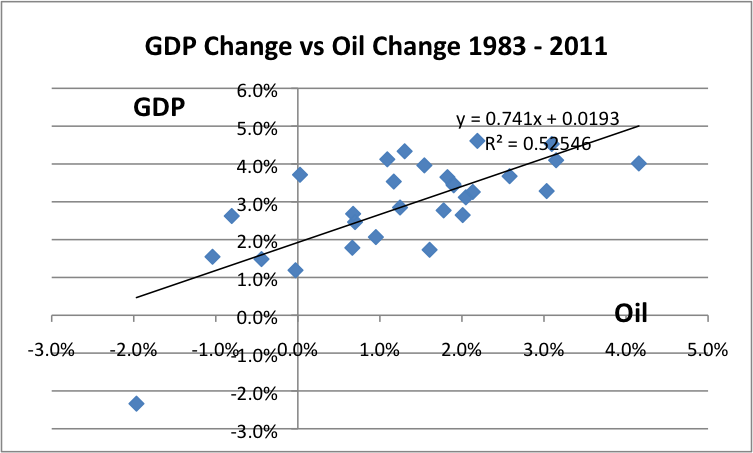 We can use the relationships between the individual year changes in oil supply and real GDP to build a simple model showing how much of an increase in GDP can be expected to take place for a given increase in oil supply. Figure 4. An “X Y” graph showing the percentage changes in world real GDP that correspond to percentage changes in world oil supply, for the years 1970 to 2011. It is clear in looking at the data (for example Figure 2) that the pattern in the earliest part of the period is different from that in the later periods. 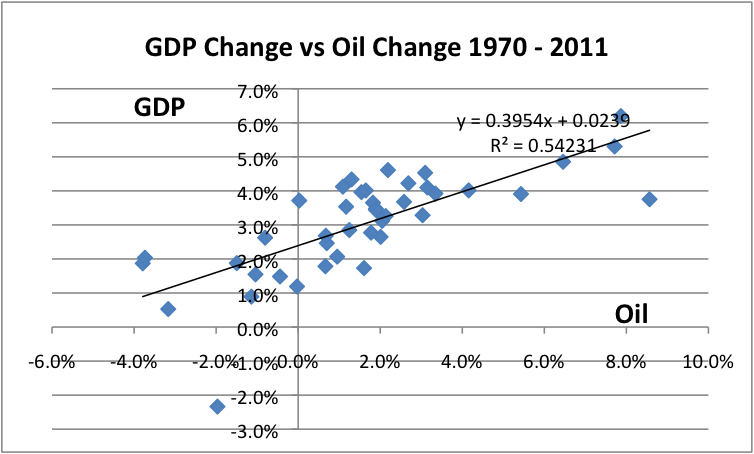 In the very earliest period (1970 to 1973), oil use increased more rapidly than GDP. Once we realized we had a problem, there was a mad dash to try to reduce usage. If we look at only the period since 1983, when there was more of a sustained attempt to transfer to lower priced fuel, this is what the graph looks like. Figure 5. An “X Y” graph showing the percentage changes in world real GDP that correspond to percentage changes in world oil supply, for the years 1983 to 2011. Using only the recent data, the R2 is similar (.53 for 1983-2011 data vs. .52 for 1970 to 2011), but the slope of the line is a little steeper. While at R2 of .52 or .53 is not exceptionally high, it does explain a significant portion of the total variance, so let’s look at what the indications of the trend lines are. If the annual percent change in oil supply is 0.4% (as it seems to be now), the predicted annual increase in world real GDP is 2.5% per year using the 1970-2011 fit, or 2.2% using the 1983-2011 fit. Thus, both fits suggest that with the small increases we are seeing in oil supply currently (about 0.4% per year), we are already at a point where world real GDP can be expected to be much lower than most economists would prefer (2.2% or 2.5% per year). The Figure 5 fit (using 1983 to 2011 data) would seem to be slightly better for predictive purposes, since it is more representative of the current situation. If we want world real GDP to grow by 4.0% per year, the fit from Figure 5 (based on the equation y = 0.741 x + 0.0193) would suggest that world oil supply needs to rise by 2.8% per year. 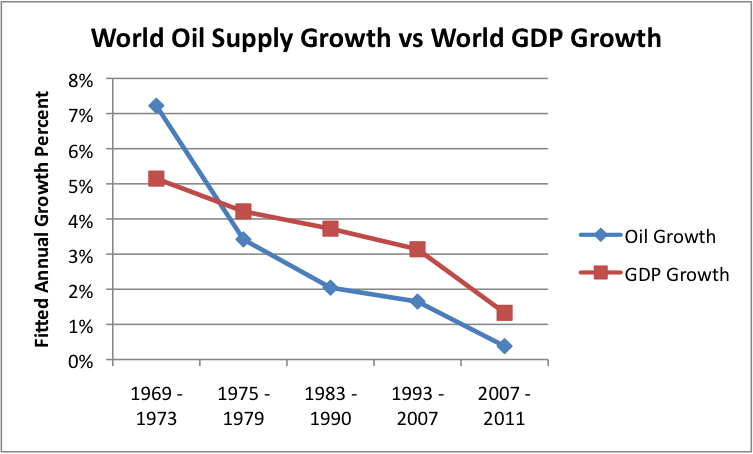 If we want world real GDP to grow by 3.0% per year, we need oil supply to grow by 1.4% per year. We can also look at what theoretically would happen if world oil supply starts declining (but here we are on shakier ground, because of many follow-on effects). If oil supply declines by 1.0% per year, the regression line in Figure 5 would suggest that world real GDP can be expected to increase, but by only 1.2% per year. If world oil supply declines by 2.0% per year, the model would suggest world GDP can be expected to increase by only 0.4% per year. If world oil supply declines by 4.0% per year, the model would suggest that world real GDP can be expected to decline by 1.0% per year. In a decline situation, there would be very substantial changes of many types. Many countries and businesses would find their financial situations much worse. For example, oil exporters who discover large decreases in the amount of oil they export may be subject to political disruption or civil disorder, and oil supply could fall off further. Or buyers of oil might discover that their current financial problems have worsened. All of these thing point to the possibility that what started out as a small decline in oil supply could quickly become a much larger decrease. Or financial impacts could spread, if one bankruptcy leads to other bankruptcies. Even without adjustment, the GDP indications if oil supply should decline are very concerning. They would seem to indicate long-term major recession or depression, especially in countries such as the United States and most European countries, which tend to have lower GDP growth rates below the world average. I should point out that in this analysis I used real GDP data from the USDA Economic Research Service, in 2005$. The USDA data shows world real GDP growth of 4.10% for 2010, and projects 2.68% for 2011, 2.95% for 2012, and 3.59% for 2013. As far as I can tell, part of the issue of multiple estimates of world GDP is that some methods give relatively more weight to emerging and developing economies in the calculation of the world average. This would tend to make their world average real GDP amounts higher. Developing real GDP indications for a country is not too difficult; it is that aggregation that is the problem. The relationships I have shown are based on USDA Economic Research Service world GDP numbers. To be made comparable to IMF world real GDP growth percentages, they might need to be adjusted upward by as much as 1.2%. Thus, for example, instead of saying, “If we want world real GDP to grow by 3.0% per year, we need oil supply to grow by 1.4% per year,” perhaps we should say, “If we want world real GDP to grow by the IMF’s 4.2% per year, we need oil supply to grow by 1.4% per year.” The principle would be the same, but the world GDP as reported by the IMF would be a little higher. This entry was posted in Financial Implications and tagged GDP, oil consumption, oil supply, real GDP. Bookmark the permalink. 67 Responses to How much oil growth do we need to support world GDP growth? To come back to your question on the impact on food items, higher energy prices affect production costs (directly through fuel and fertilizers), as well as due to the higher the cost of moving food from the farmgate to the market. Obviously, the effect will be less for commodities with a high value and low weight and vice versa. Estimates suggest that a 10% increase in energy prices is associated with a 2 to 3% increase in the prices of grains and vegetable oils (also see Commodity Annex, P10 http://siteresources.worldbank.org/INTPROSPECTS/Resources/334934-1304428586133/GEP2011bCommodityAppendix.pdf ). Note also that over the longer term, high energy prices tend to affect food prices through the biofuel channel. Thanks for the link! Food, of course, has other influences in its cost besides energy prices (particularly oil prices). You mention the conflict with biofuels driving up prices. So some of the links are longer term. Another big issue is weather conditions. If we are looking ahead over the longer term, these will make a big difference. There seems to recently be a change in patterns, with the drought we are having in the Midwest, the lack of monsoons in India, and the extra rain in Britain and China. Our agriculture depends on having rain of the appropriate amounts, and not too high temperatures. I expect food prices will go higher in the future, because of a growing mismatch between what agriculture has planned for, and what happens. The problem with nlecuar power is that it cannot compete in the free, competitive marketplace without massive federal subsidies. It is the most subsidized energy industry in the country and is looking for even more federal subsidies in the energy legislation now before Congress. The true conservative position should be in opposition to all of the insurance, tax, loan guarantee, waste disposal and other taxpayer-provided subsidies that so distort conservative economic decision-making. It is simply laughable to equate free enterprise with the heavily subsidized government-supported nlecuar industry.